here’s that bill evans show from kobe in 1978. it is very hard to find out anything about this – so much so that i am now asking myself if it was properly labelled in the first place. on the other hand, i did find a japanese bootleg online, that claims to be this show, and refers to comments in the tape to back it up (it also indicates it was an audience recording). i’d have ordered that, just out of curiosity, but the japanese website was too hard to navigate for obvious reasons. the notes below are from when ‘bluenote2005’ shared this on dime in july 2007.
help with set list please. also track 5 and 8 had a gap of silence. i removed the silence and the tracks play much nicer. i don’t have the software to bridge the tracks together. up on dime, plaz_restore has been seeding a 22-part “miles in france” series (most [all?] of the shows were recorded by ‘looping’). part 7 will be missing — it was released on a pay-per-view and won’t be allowed on dime (nor here). this series has been around before, but i’ve tended not to listen to 1980’s miles davis (makes you wonder, doesn’t it?) 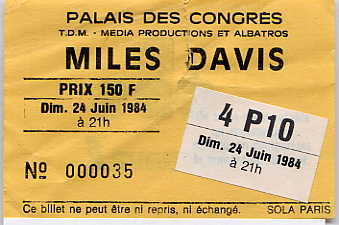 so for me these shows are new & the music less familiar than miles’ older material. anyway, this post is a ‘happy new year’ for my friends pete & karen and also steve w., all fans of miles (and of new orleans jazzfest, come to think of it). i’ll be putting up the setlists and links bit-by-bit, all here in this post (for an easy one-stop-shop). the setlists will all be copied completely unchanged from the info files included with the seeds. done! they’re very nice recordings (been listening to a lot of these), a real tip ‘o the hat to ‘looping’. i think that it’s interesting to hear a sequence of several shows on consecutive nights (well, it can be sometimes, and this is definitely one of those times). 3:cut at the end of the tape. very few missing (no time to change the tape). notice: these audio files have changed from the original seed. the audio files have been declipped. same line up but fm. 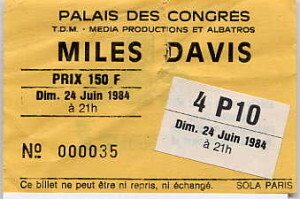 miles davis (tp); john scofield (g); bob berg (sax); bobby irving (kb); darryl jones (b): al foster (d); steve thornton: perc. sorry folks, canal+ is a pay channel and we consider their broadcast as official material. CD1t07 _: beginning of CD2 with fade out. i am not sure to have all what have been broadcasted. these audio files have changed from the original seed. the audio files have been declipped. -plaz, 2015-01-08.
these audio files have changed from the original seed. the audio files have been declipped. these audio files have changed from the original seed. the audio files of cd1 have been declipped. -plaz, 2015-01-10.
and included in this download. (see note 3 below). i made a new extraction from my tape, cut and adjust levels. it should replace exactly the bad file on the cd. copies of concerts that i’ve enjoyed or maybe just that i’ve been listening to, and very occasional notes. mostly jazz, mostly flac format, but no official releases. decryption keys are in the comments.